Trade Only plans to look regularly at specific sectors of the boat industry in our Market Watch, either focusing on a specific region or type of boat. This month, we’re examining the market in South Florida. South Florida has always been a boating Mecca. The conditions are nearly perfect: a peninsula surrounded by crystalline water, a year-round boating season, plenty of amenities for boaters, and proximity to several tropical destinations. It might be because the area is so intertwined with the marine industry that South Florida feels the economic decline so intensely. New boat sales in the region fell 33 percent from August 2007 to August 2008 — from 3,157 to 2,112 according to figures from Info-Link, a Fort Lauderdale-based company that tracks new-boat registrations nationwide (www.info-link.com). Those numbers refer to 17-foot-and-above outboard fiberglass sport fishing boats, a South Florida mainstay. The region experienced a 20 percent decline in the second quarter of 2008 from the year-ago period, while the nation overall saw sales dipping 14 percent. 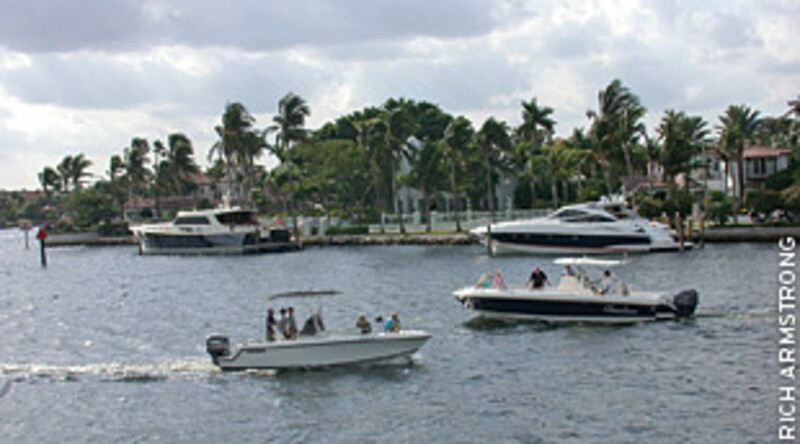 The second and third quarters are typically when the most boats are sold in South Florida, which encompasses Broward, Dade, Monroe and Palm Beach counties. Although the area has been dramatically influenced by the nationwide mortgage crisis, there are some unique market conditions in South Florida that have contributed to lagging sales. The state was pounded with hurricanes and storms in 2005 that left people scrambling to meet basic needs and get businesses up and running. Then, as marina owners faced higher insurance premiums in the storms’ aftermath, more of them sold out to developers, further raising fears that boaters would have limited or no access to water. Adding the area-specific problems to the weak national economy explains the sharper drop in sales, says Steve Sprague, co-owner and vice president of Tuppens Marine and Tackle in Palm Beach County. 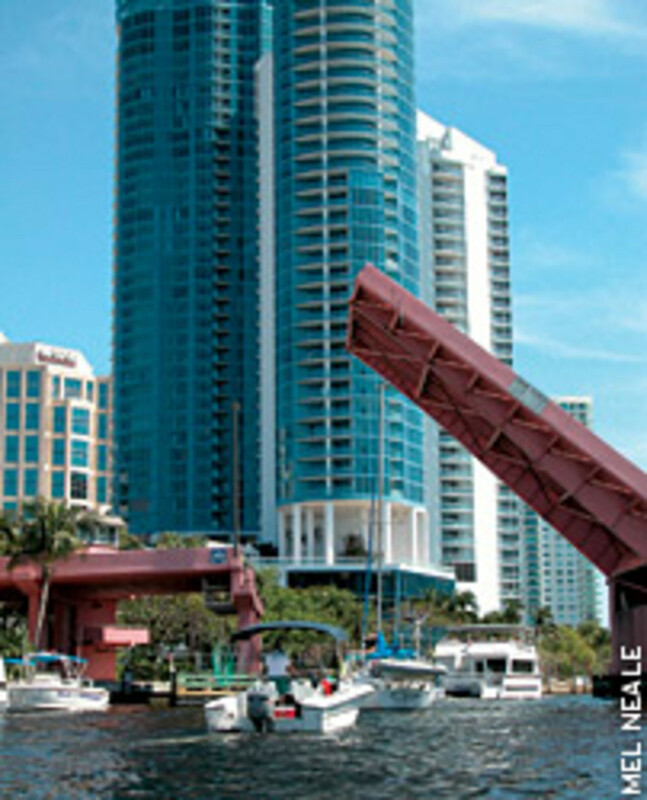 The marine industry’s economic impact in Broward County alone has been estimated at $10.8 billion. For the state as a whole, the marine industry impact is $18.4 billion — more than twice that of the Florida citrus industry ($9.1 billion), says Frank Herhold, president of the Marine Industries Association of South Florida. “In this area, economic conditions seem to hit us a little bit later and, in the past, we seemed to pull out of them a little bit sooner,” Herhold says. Dealers in Florida felt they were in a recession-proof area, says Sprague. The mortgage crisis spawned the situation, Sprague explains. Million-dollar homes and condominiums are prevalent in the four-mile stretch of Palm Beach. But after the housing bubble popped, there was a glut. “That eventually hits us,” says Sprague. Now the masons and construction workers are out of work and, as a result, are out of the boat-buying market, Sprague says. During the boom in 2006, Tuppens Marine had its best year, with $15 million in sales. In 2007, sales were down more than 40 percent, Sprague says. “There were a lot of people making money flipping houses and buying spec houses, and when it bottomed out, a lot of people got stuck with property and it hurt them financially,” he says. So far in 2008, the Lake Worth dealership is off 20 percent, Sprague says. When owners saw sales slipping so dramatically in 2007, they began to aggressively control inventory, Sprague says. Since the cutback began, the dealership, which sells Albemarle, Contender and Skeeter boats, has reduced inventory 40 percent. Service and accessories sales have been strong, and that has helped offset the dip. Because home values were so inflated in South Florida, they plummeted even more acutely than in other regions. But Sprague thinks the market has already hit its low. Joel Feeger, owner of Joel’s Outboard Marine in Fort Lauderdale, agrees. Business at Joel’s Outboard Marine has been off about 15 percent in the last year, but was also off about 15 percent the year before, Feeger says. Even though Florida hasn’t had a year like 2005 as far as storms, the threat still takes its toll on the marine industry. Hurricane Wilma is fresh on some people’s minds, Feeger says. That 2005 storm left him and many others without electricity for three weeks. As a result, he says, people are always on the edge of their seats during hurricane season. “Even if you don’t get clobbered, you get ready for a few days or a week, you go through the storm, and then you spend a week cleaning up,” Feeger says. “The next thing you know, it’s been a few weeks” of not concentrating on business. George LaChapelle, general manager of Lindsey Marine in Stuart, thinks the storms can also bring revenue. “The storms definitely had a temporary impact on revenues, but it didn’t last long,” LaChapelle says. People in the building trades, for example, became boat buyers, thanks to the massive rebuilding job. Now that buyer is gone, and LaChapelle’s typical buyer has changed. The average buyer was between the ages of 30 and 40 a few years back, when contractors were repairing the damage and building new homes. In their choice of boats, that clientele is actually downsizing, says LaChapelle. Boats in the 7- to 14-foot category – which includes a lot of tenders and small inland fish boats – fared best in the second quarter of this year. Sales fell 11 percent from the 2007 quarter, an improvement from the 12 percent decline between the 2006 and 2007 quarters. The sharpest decline was in the 15- to 19-foot range. Sales fell 28 percent from the second quarter of 2007 to the second quarter of 2008, from 1,716 to 1,228 units. The decline between 2006 and 2007 was 11 percent from 1,933 to 1,716, for a total of a 36 percent drop in two years. Backing up the trend toward smaller vessels, there was a 22 percent drop in sales of boats larger than 40 feet from 2007 to 2008 from 283 to 221. There was no drop from 2006 to 2007, the only category that stayed level between those years. Regardless of the numbers, dealers in South Florida seem positive they are on the rebound, maybe more so than in other areas. Sprague says his September sales were the best in five years. Joe Lewis of Mount Dora Boating Center outside Orlando, says the same economic factors were at play in Central Florida. When the hurricanes hit in 2005, insurance rates went through the roof, Lewis says. Then, in 2006, the property tax increases were driven by hot real estate properties. That caused marinas to take lucrative deals with condo developers and close down. “The fact that people couldn’t find slips did play into making it tougher to sell boats,” Lewis says. But that all played out on the sidelines until homeowners who had taken more house than they could afford began facing increases in their adjustable rate mortgage payments. “All that discretionary income to go and buy a boat — it wasn’t there; it’s still not there,” says Lewis. Mount Dora’s sales were off about 20 percent in 2007 and 30 percent in 2008, says Lewis. Given the bad economic news, Lewis did not sell any units in October. The Marine Industry Association of South Florida is already working to help ease the issue of water access, Herhold says. A focus group is looking for ways to redevelop and expand waterfront property to provide more slips and marine services, Herhold says. Because Florida’s Amendment 6 passed in November, waterfront properties will get tax breaks, helping to offset the exorbitant costs that can get passed on to slip-holders. Dealers hope that will benefit the boating industry in Florida. Access isn’t the biggest concern for Feeger at Joel’s Outboard Marine. There are still lines at public launch ramps and that means people are still determined to get in the water, Feeger says. Feeger is more worried about the general South Florida population being tolerant of boaters. Most homeowners associations don’t allow boats to be parked in driveways, Feeger explains. One salesman got a $75 ticket for a boat parked in his driveway before taking it bass fishing. He fought it and won, Feeger says, but police strictly enforce the laws. Storing a boat at a facility can cost between $150 and $250 a month. As a result, Sprague decided to pull the larger vessels from his store a few years ago and concentrate on boats under 23 feet. Now he encourages potential buyers to keep the boats in their garages instead of paying to store them. Although it’s been pushed to the back burner by the economy, Herhold says the lack of qualified service technicians remains a crucial issue to South Florida’s boating industry. Herhold’s association has partnered with Broward College and is rehabilitating a 30,000-square-foot marine technology center in Miramar to train new technicians. Two classes are under way already to address a growing crisis in the boat service and repair. The Fort Lauderdale International Boat Show is also a beacon of hope for dealers, who often look to the show for 20 to 30 percent of their sales. Sales were down at the show, but that was expected, Sprague says. And all interviewed agree that, despite tough times, the boats are still in the water. Fuel prices and a struggling economy aren’t keeping people away from their boats; they just are not going as far.